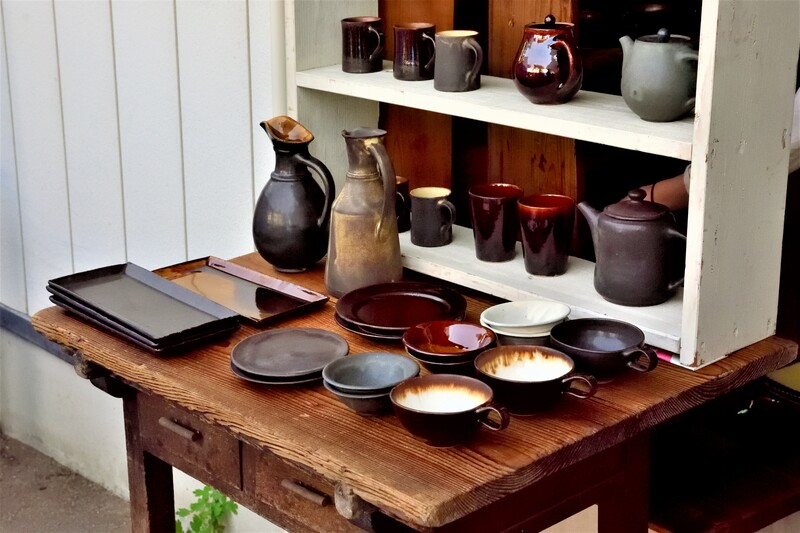 In addition to about 50 stores in Mashiko Town, there are about 500 stores by pottery artists and craftsman, and there are a wide variety of items from traditional Mashiko pottery to daily items such as cups and dishes and art objects. The Pottery Fair is held in a wide area, but "Jonaizaka and Sayado" is the main street. The tents of the Pottery Fair line about 1km on both sides of the road, ranging from individual potter's works to products from large stores where you can experience pottery making. In addition, miscellaneous goods and flowers, local special products, agricultural products and food and drink are sold. It is a big event of Mashiko that there is not enough time even if it is one day. The area around Mashiko is full of sophisticated restaurants and cafés, and you can step out of the pottery market to get out of the bustle of the pottery city and spend a relaxing time enjoying Mashiko nature. Along the way to many pottery tents, I visited the Higeta Indigo Dyeing studio, which I wanted to visit before. Indigo and Mashiko cotton products were exhibited and sold to match the pottery market. The Higeta family started indigo dyeing during the Edo period Kansei (1789-1800) and has 72 forts. You can enjoy the refreshing sensation of a dose by lightly waving the beautiful fabric of the dyed and dyed plants that feel the history in the refreshing May wind. The "Iwashita pottery shop" is an old pottery producer from 1866, where you can see a large climing pottery kiln. One is Mashiko, the oldest climbing pottery kiln, and the other is the largest in Kanto, both of which are designated cultural properties of the town. It was considerably damaged by the earthquake, and the craftsman who fixes the pottery kiln went out of business, and it was difficult to repair, but somehow he found the craftsman and he was able to repair it safely with the support of the volunteers. If you look at the powerful climbing pottery kiln, which is also a symbol of Pottery village Mashiko, you will feel the feelings and enthusiasm of the potter who is embedded in the vessel from the previous generation. And I was able to realize the deep relationship with nature such as the smell of fire and soil. The "Toko" on the Jonaizaka street is one of the highlights of the gallery itself, and the beauty of the ceiling, beams, etc. that used the part of the stone warehouse at that time was astonishing. In each space, traditional Mashiko-yaki and modern crafts are lined up. It's only original and can only be bought here. Tatami's gallery space is used for exhibitions, etc. in the store area of the fertilizer business era. The matching of tatami mats and antique furniture with pottery makes me feel nostalgic and the depth of the Japanese space. The glaze that colors trees, Otani stone, vessels and vessels is all born from the blessings of nature. When you touch works made with natural materials, you can feel the mind calm and realize what you want to be the basis of your lifestyle. There is a work of a popular potter on the "back alley tent" located a little away. People gather in the tent of your favorite potter's tent early in the morning, and unique works are sold like flying. There was also a good-looking florist selling swag. Swagg is a wall decoration, and the bouquet of this florist is not a bouquet that can be in a vase, but is decorated with a wall as it is, and a flower material that can be enjoyed until it becomes a naturally dried flower is used. It gives fresh colors and healing to the crowded and lively venues. People who came to the pottery fair were happy with their swag and bouquet, had freshly brewed coffee at the tent counter, and found their own fun at Mashiko besides visiting pottery fair. There are many visitors from overseas as well as the whole of Japan, and you can see the high degree of attention of Mashiko Yaki. If you are going to buy a popular potter's work, we recommend that you line up from early in the morning and receive a numbered ticket. Recently, it seems that there are many cases in which you use the SNS to research in advance and then go to the pottery fair. Sometimes it is a battle to buy popular pieces. There are not two identical vessels made by human hands, and many people gather at Mashiko in search of their precious encounters. 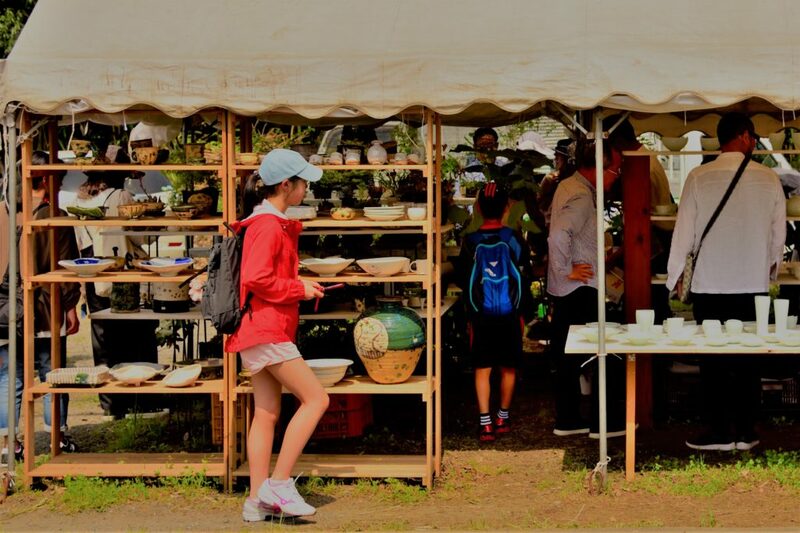 It is healed by Mashiko's clear air and nature, and Mashiko's pottery city can be satisfied just by enjoying the atmosphere of this vibrant pottery fair. As the needs for lifestyle improvement and change increase, you will gain various "awareness" based on living in harmony with nature. Coming from Tokyo, the train journey to Mashiko takes about two hours. The following routes assume you are using the Shinkansen. Local trains will also get you there but will take longer. Take the Shinkansen on the JR Utsunomiya Line from either Tokyo Station or Ueno Station to Oyama Station in Tochigi. Change at Oyama for the Mito line going toward Mito. Get off at Shimodate Station and change to the Moka Tetsudo line going toward Motegi. The tenth stop is Mashiko Station.